The Forme of Cury, a medieval English cookery book from 1390, which mentioned mulled wine, says: "Pur fait Ypocras …" grinding together cinnamon, ginger, galangal, cloves, long pepper, nutmeg, marjoram, cardamom, and grains of paradise ("spykenard de Spayn", rosemary may be substituted). This is mixed with red wine and sugar (form and quantity unstated). Glühwein (roughly translated as "glowing-wine", from the temperature the wine is heated to) is popular in German-speaking countries and in the region of Alsace in France. It is a traditional beverage offered during the Christmas holidays. In Alsace Christmas markets, it is traditionally the only alcoholic beverage served. The oldest documented Glühwein tankard is attributed to Count John IV of Katzenelnbogen, a German nobleman who was the first grower of Riesling grapes. This gold-plated lockable silver tankard is dated to c. 1420. Glühwein is usually prepared from red wine, heated and spiced with cinnamon sticks, cloves, star aniseed, citrus, sugar and at times vanilla pods. It is sometimes drunk mit Schuss (with a shot), which means that rum or some other liquor has been added. Fruit wines, such as blueberry wine and cherry wine, are occasionally used instead of grape wine in some parts of Germany. There is also a variation of Glühwein which is made with white wine. However, white Glühwein is less popular than its red counterpart. For children, the non-alcoholic Kinderpunsch is offered on Christmas markets, which is a punch with similar spices. Glögg, gløgg, glögi and similar words are the terms used for mulled wine in the Nordic countries (sometimes misspelled as glog or glug). It is spelled gløgg in Norwegian and Danish, glögg in Swedish and Icelandic and glögi in Finnish and Estonian. In Denmark, Norway and Sweden, gløgg or glögg is often drunk at Christmas events. Non-alcoholic and alcoholic versions of glögg can be bought ready-made or prepared with fruit juices instead of wine. The main ingredients of alcoholic glögg are red wine, sugar, spices such as cinnamon, cardamom, ginger, cloves, and bitter orange, and optionally also stronger spirits such as vodka, akvavit, rum or brandy. Throughout Scandinavia, glögg spice extract and ready-mixed spices can be purchased in grocery stores. To prepare glögg, spices or spice extract are mixed into the wine, which is then heated to 60-70 °C. When preparing homemade glögg using spices, the hot mixture is allowed to infuse for at least an hour, often longer, and then reheated before serving. Ready-made wine glögg, as well as low- or non-alcoholic varieties, is normally sold at Systembolaget in Sweden, and in Alko in Finland, ready to heat and serve, and not in concentrate or extract form. Glögg is generally served with raisins, dried cloves, blanched almonds and Ginger biscuits (Ginger Snaps), and is a popular hot drink during the Christmas season. In Sweden, ginger bread and lussebullar (also called lussekatter), a type of sweet bun with saffron and raisins, are typically served on December 13 to celebrate Saint Lucia's Day . It is also traditionally served at the julbord, the Christmas version of the classic, Swedish buffet smörgåsbord. In Denmark, gløgg pairings typically include æbleskiver sprinkled with powdered sugar and accompanied with strawberry marmalade. In Norway, gløgg is paired with rice pudding (Norwegian: riskrem). In such cases, the word graut-/grøtfest is more precise, taking the name from the rice pudding which is served as a course. Typically, gløgg is drunk before eating the rice pudding, which is often served with cold, red cordial (saus). Glögg recipes vary widely; variations with white wine or sweet wine such as Port or Madeira, or spirits such as brandy or whisky are also popular. Glögg can also be made without alcohol by replacing the wine with fruit or berry juices (often blackcurrant) or by boiling the glögg to evaporate the alcohol. Glögg is similar in taste to modern Wassail or mulled cider. In Croatia, Bosnia and Herzegovina, Montenegro, Slovenia and Serbia, kuhano vino/kuvano vino/кувано вино ("cooked wine"), is made from red or white wine and various combinations of nutmeg, cloves, cinnamon, sugar and orange zest, often served with slices of orange or lemon. In Bulgaria, it is called greyano vino (Bulgarian: греяно вино) ("heated wine"), and consists of red wine, honey and peppercorn. Sometimes apples or citrus fruits, such as lemon or oranges, can be added. In Chile it is called "candola" in the south and "vino navega'o" in the north ('navegado' is considered a hypercorrection) ['sailor; navigated']. Navega'o is a hot drink made from red wine, orange peels, cinnamon sticks, cloves, and sugar. Although being considered a southern Chile beverage, it is served throughout the country. Many people regard it as Winter drink. Saint John's Eve (Spanish tradition which replaced 'Wetripantru', the Mapuche New Year's Day that coincides with the Winter Solstice in the southern hemisphere—Midsummer in the northern hemisphere) on the evening of 23 June would be, for example, a good moment to drink 'navega'o'. In Slovakia, mulled wine is called varené víno (“boiled wine”), and is usually served during the Christmas season. In North Macedonia, it is called vareno vino (Macedonian: варено вино, boiled wine) or greeno vino (Macedonian: греено вино, heated wine) and is usually served in late autumn or winter. It is made of red wine, usually from the Tikvešh region, combined with cinnamon and sugar or honey. The wine heated in a combination with pepper is used as a prevention from flu or cold. In Russia, Глинтвейн ("Glintvein") is a popular drink during winters and has same recipe as the German Glühwein. Additionally, the traditional Russian winter herbal drink sbiten, although usually a non-alcoholic tisane made with hot water, may also be made with red wine replacing some or all of the water. ^ Cloake, Felicity (9 December 2010). "How to make perfect mulled wine". The Guardian. Retrieved 5 February 2012. ^ John, J. (2005). A Christmas Compendium. Continuum. p. 80. ISBN 0-8264-8749-1. ^ Thomas Dudley Fosbroke (1835). A Treatise on the Arts, Manufactures, Manners, and Institutions of the Greeks and Romans. Longmans. p. 327. ^ Pegge, S., 2007. The Forme of Cury. BiblioLife. ^ Mayson, I.M., (1861). 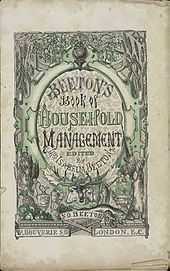 Mrs Beeton's Book of Household Management. London and Melbourne: Warde, Lock and Company Ltd.
^ Cloake, Felicity. "How to make perfect mulled wine". The Guardian. Guardian News and Media Limited. Retrieved 22 April 2016. ^ "Activities: Make Your Your Own Victorian Wassail Punch". BBD. Retrieved 22 April 2016. ^ "Glögg Alkoholfri: Mulled red wine, non-alcoholic". IKEA. Retrieved 2012-11-24. ^ Hamilton, C. (2005). Brazil: A Culinary Journey. Hippocrene cookbook library. Hippocrene Books. p. 197. ISBN 978-0-7818-1080-7. Retrieved February 3, 2015. ^ Herrera-Sobek, M. (2012). Celebrating Latino Folklore: An Encyclopedia of Cultural Traditions [3 volumes]. ABC-CLIO. p. 147. ISBN 978-0-313-34340-7. Retrieved February 3, 2015. ^ "Ten things you need to know to celebrate Sinterklaas". Dutchnews.nl. 28 November 2015. Retrieved 14 December 2015. ^ Holton, N. (2014). Bisschopswijn. Thedutchtable.com (accessed 21/12/2015). ^ Jansen, R. (2012). Sinterklaas en Bisschopswijn. Wijnbloggers.nl (accessed 21/12/2015). ^ "Russian Sbiten Recipe". About Food. Retrieved 2 February 2016. NPR Staff. "Get into the Holiday Spirit with Scandinavian Glogg". All Things Considered. NPR. 22 December 2011. Wikimedia Commons has media related to Mulled wine. This page was last edited on 21 March 2019, at 00:27 (UTC).